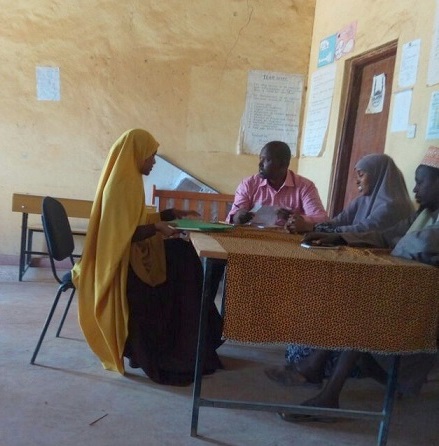 Since I joined the team at Open Learning Exchange (OLE) in November, I have been immersed in launching PeaceBuilders in Somalia––a program that aims to empower refugees and the communities in which they resettle. Nine years ago, I was lucky to begin my career at Denver South High School, a school that specializes in services for resettled refugee students, and, through its diversity of opportunity and inclusive community, many recent arrivals thrive at the school. My work there inspired me to continue to seek opportunities that purposefully engage refugees, so I jumped at the chance to serve OLE as the program lead for PeaceBuilders in Somalia. From recruiting the first 40 PeaceBuilders in the Dadaab refugee camp to our ultimate goal of improved outcomes in villages throughout Somalia, this program promotes continued community-centered learning and improvement.The 60 PeaceBuilder applicants included school leaders, health workers, and activists for women’s rights, and the 40 selected will serve as career-pathways course developers and later PeaceBuilders working in Somali villages. This work generates two outcomes: it generates widely accessible, learner-centered career-readiness courses for communities and empowers individuals with a personal sense of possibility, agency, meaning and global connection. And ultimately, at its core, refugees remain core agents and decisions makers throughout the PeaceBuilders in Somalia mission, a key recommendation of the Global Compact on Refugees. I am excited to arrive in Kenya this week and personally meet the newly hired PeaceBuilder teams in Dadaab and our OLE Somalia team. These newly hired PeaceBuilders join us thanks to the tireless recruitment efforts of our OLE Dadaab team, who have been operating our Community Learning Centers for nearly four years. Joining them in this effort is the newly-formed OLE Somalia board, which has been at work establishing OLE Somalia in Mogadishu, developing syllabi, and exploring villages for peacebuilders to begin work once they return to Somalia. It is inspiring to see so many individuals committed to this work, and I am excited to continue learning from them! This entry was posted in Blog and tagged Community learning, Dadaab, education, Global Compact on Refugees, Somali refugees, Somalia, UNHCR, UNICEF. Bookmark the permalink.